Reports on recent conferences attended by RiPL members. If you have attended an event or conference of interest to our RiPL Network, by all means send us a short report. It's helpful to everyone to know just what is going on in the field of primary language learning. 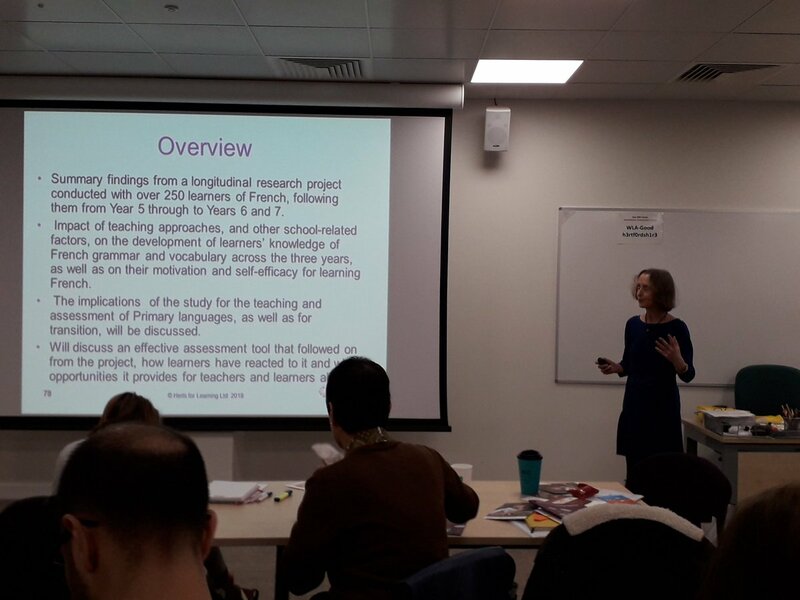 Suzanne Graham from the University of Reading spoke at the Herts for Languages Primary Leaders of Languages Conference on 30 November on ‘Progress and Preparedness in Primary Languages- issues of teaching and assessment’. The talk addressed the question of assessment for Primary Languages by giving summary findings from a longitudinal research project conducted with over 250 learners of French, following them from Year 5 through to Years 6 and 7. It explored the impact of two different teaching approaches, and other school-related factors, on the development of learners’ knowledge of French grammar and vocabulary across the three years, as well as on their motivation and self-efficacy for learning French. The implications of the study for the teaching and assessment of Primary languages, as well as for transition, were also discussed. Suzanne then went on to explain how The Language Magician, a computer game assessment tool, followed on from the project. She reported findings on how learners across England, Spain, Italy and Germany have reacted to the game, which has been tested across the four countries with 3437 learners with different levels of attainment and aged between 7 and 14. 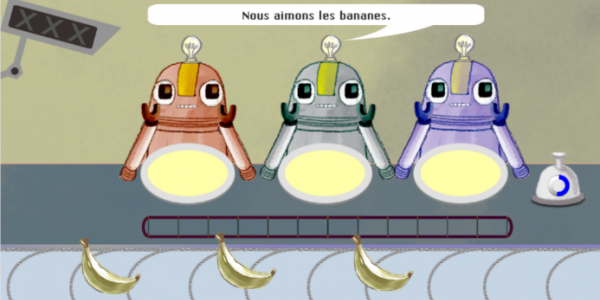 A questionnaire completed by learners after playing the game showed high levels of enjoyment in playing it and a belief that it told them how well they were doing in the language in question. Levels of positivity about the game were not related to age, and only weakly related to learners’ scores on the game, suggesting that it appealed to both older and younger learners and across the attainment range. Read more on The Language Magician. On Friday 9th November at The Language Show at Olympia, Richard Hardie and Bernardette Holmes MBE from Speak to the Future, in partnership with Benoît Le Dévédec of the Institut Français and Vicky Gough from the British Council, presented a seminar on "Why Languages are essential to us all post-Brexit". A panel of leading speakers took the floor, including Rubén Barderas Rey, Education Adviser Consejería de Educación, Ignacio Peyró Jiménez, Director Instituto Cervantes, London, Karl Pfeiffer, Director of Educational Links, Goethe Institut and Antonella Sorace, Director of Bilingualism Matters, Professor of Development Linguistics, University of Edinburgh. The seminar also showcased how to develop a successful primary languages curriculum for the future. Bunmi Richards, Head Teacher from Shaftesbury Park Primary School and Philip Yorke, Subject Lead gave an inspiring example of how their school puts language policy into practice through a bilingual stream in French. In June 2018, Dr Elizabeth Wonnacott (UCL) and Dr Helen Brown (Nottingham Trent University) hosted a workshop on Second Language learning in the Primary Years. The workshop brought together language teachers and researchers to learn about and give feedback on recent research studies investigating language learning in the primary years. The presentations focussed on the theme of computerised tools for language learning, including the learning of tones in Chinese (Dr Helen Brown, NTU), word order in Japanese (Dr Elizabeth Wonnacott, UCL), and vowel sounds in English (Gwen Brekelmans, PhD student, UCL). Dr Rowena Kasprowicz (RiPL theme leader, Linguistic Development and Expectations) presented her work on the development and evaluation of a game to teach grammar (verb endings) in French. Attendees also received a demo of the new OASIS database (an online, open-access repository for accessible summaries of language learning and teaching research). The day finished with a thought-provoking round-table discussion of the use of computerised tools in the classroom. The talks and discussion highlighted, not only that computer-based tools can be effective as well as engaging, but also that the rich data gathered through such tools can potentially give us a much clearer picture of the learning process. Hosted by the School of Education, University of Iceland, the conference on Early Language Learning: Multiple perspectives, proved an inspiration, with many excellent research presentations. A theme emerging throughout the conference was the need to find ways of addressing challenges of increasingly multilingual classroom contexts. For Iceland particularly, the recent experience of new migrant arrivals has focused attention, with teachers urgently seeking out ways to draw on this rich multilingual resource for all pupils to benefit. Responding to this central theme, plenaries from Gunhild Alstad (Norway) and Roma Chumak-Horbatsch (Canada) offered both research and practical classroom solutions, while Francis Hult’s (Sweden) final plenary left us in no doubt that language policy and planning is the responsibility of all of us, teachers, parents, school principals as well as policy makers. 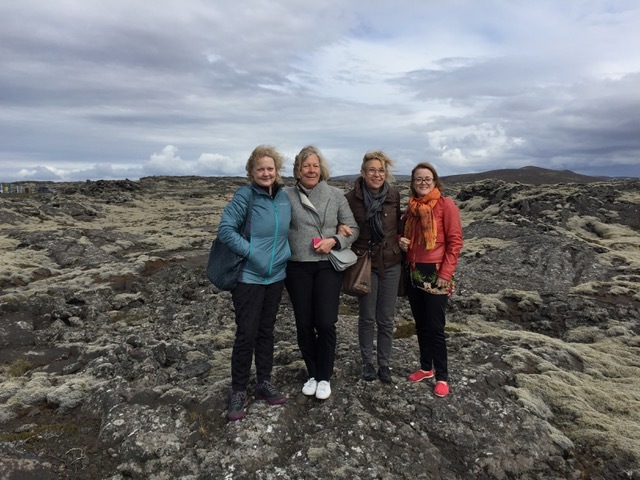 For conference delegates Reykjavik proved to be an exotic venue, with many taking the opportunity to explore the nearby geysers, waterfalls, wild landscape of lava fields and ash deposits from old and new volcanic activity. Perhaps the most dramatic sight however, was visiting the area where the Eurasian and North American tectonic plates are moving away from one another – shifting apart 2 cms. every year, creating a rift valley some 4 kms. wide in one region. An exciting and unique conference in every sense!